As soon as we arrived at this Garden of Eden the General Manager, Thomas, came to greet us. After exchanges of pleasantries, he advised, “Laos is the Democratic People’s Republic, going by the acronym PDR, otherwise known as “Please don’t rush”, and I recommend that you get yourself in the mood of the city”. We smiled, for, after just a few minutes, we were already soothed, our muscles relaxed and our mood lifted by the greenery, the smiles of the Laotian people we had met and the swimming pool which reflected the clouds like a vintage mirror. 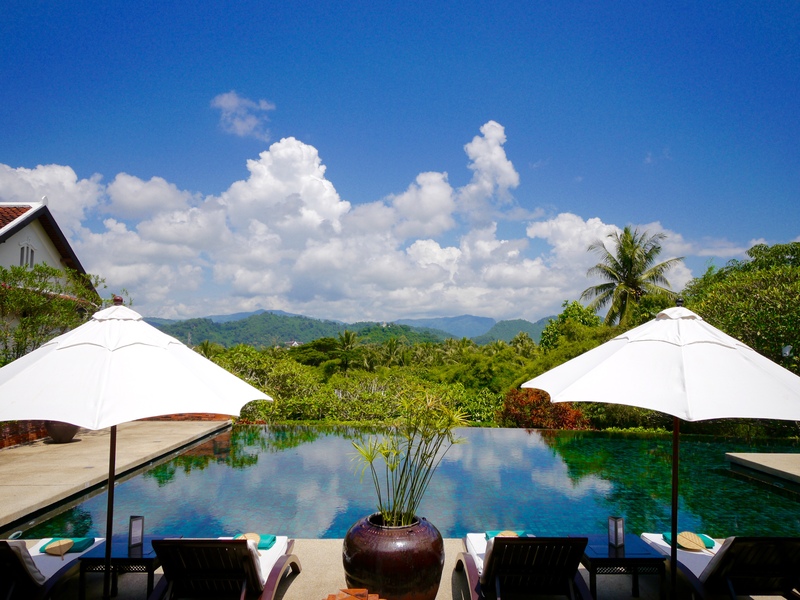 We had arrived and we were in for a wonderful stay at the Belmond La Residence Phou Vao, in the heart of Luang Prabang. The Hotel offers VIP pick up and drop off service for $80 per person. That includes someone handling your arrival procedures, the visa and the baggage collection so you can get out of the plane, walk into the terminal and out into the hotel’s spacious minivan within minutes and can avoid the long queues that form during the high-season. We went to Luang Prabang in September, the slowest month of the year, at the end of the rainy season. Although the airport is very small and receives very few flights, mostly domestic or from Bangkok, the two aircrafts from the Thai capital arrived at the same time, as they always do because they are scheduled to land 20min from each other so, in the higher season, there can be a relative bottleneck in the tiny airport. In the minivan we had cookies, water and cold towels. The hotel offers WiFi service through a pocket WiFi device using the mobile network so you can connect as soon as you sit down in the comfortable seat. We only had time to download emails in the short 15min ride to the hotel. As soon as we arrived, we were seated in comfortable armchairs at the reception lobby to fulfill the arrival formalities. After discussing the various activities and the lucky weather with Thomas and the team, we were shown to our room which was ready to welcome us. As our luggage was coming with the VIP service we had a few minutes to be shown where everything was in the room with Velra, the extremely friendly, kind and knowledgeable Receptionist who helped us check-in. She was polite and lovely and we were very pleased with the room. 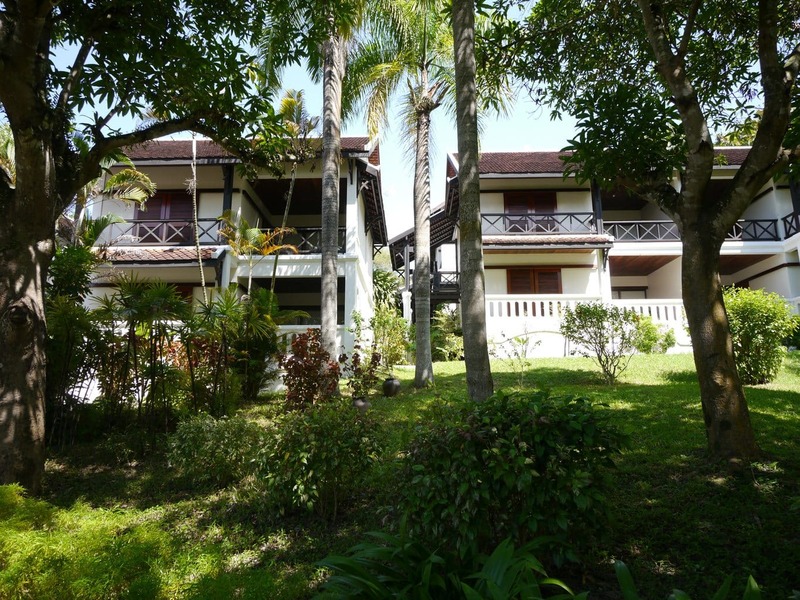 La residence Phou Vao has 34 suites, most of which have sweeping views over the lush greenery of Luang Prabang and onto the Phou Si Temple. 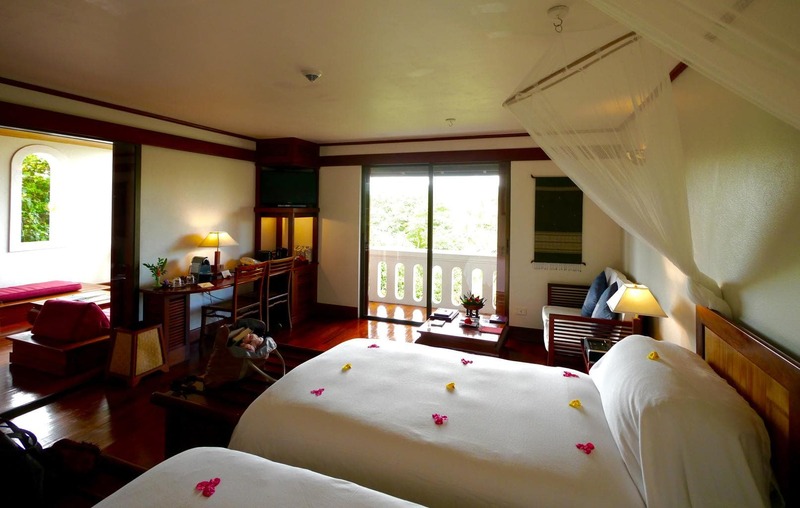 Our suite had a wonderful balcony along the bedroom and a verandah with perfect privacy to unwind, read or enjoy the sunset. 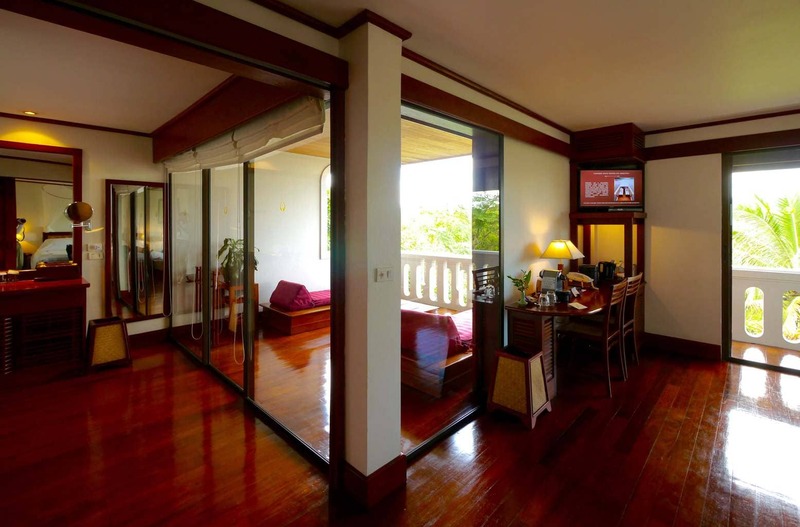 The furniture and floors were made of teak and colonial in style. The toasted orange color of the wood was complemented by pretty orange and red carnation flowers strategically dotted around the room. Our beds were sprinkled in red and yellow flower petals over white linen. The decor was exquisitely vintage yet modern and completed with many a detail that went a long way to show a personal touch. The usual tea set was paired with a Nespresso machine. The desk was filled with lovely local gifts including an oil lamp made in the local village and a pretty frame showcasing some of the local Laotian textile handicrafts. We had a TV, with a long list of movies available for borrowing, but we preferred to wake up early for sunrise and alms giving so our evenings were not too late. We did not see any mosquitoes in the room but we had a plug-in mosquito repellent the hotel was turning on every evening and mosquito nets hanging from the beds which were magically laid on top of our beds every night. The bathroom was fabulous. 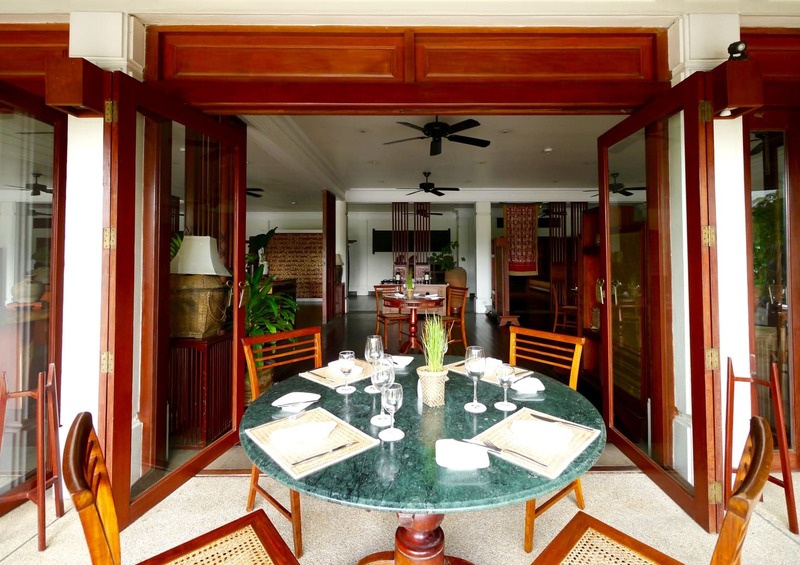 It was large and opening into the verandah giving a sense of space and bright natural light. The bathtub was made of stone but relatively small and the shower was great, with fantastic pressure. All the toiletries were natural and organic and refilled daily. I particularly appreciated the refilling which was seamless, transparent and good for the environment. Being two girls and showering twice a day we never ran out of shampoo or conditioner so a tooth fairy must have refilled them while we were away. The verandah was my favorite part of the room. Filled with two low Thai style pyramid seats it was inviting and secluded. Although the hotel is near the city and you could see some of the tuk tuk in the distance, the room was peaceful and quiet and there was never any noise waking us up. Instead, we felt as if we could hear the far-away and soothing sound of rural life. The only restaurant on site is directed by an Italian chef who has lived in Asia for a long time. All the food we tried was excellent and there were a few local specialties as well as other European and Asian options. We found the food to be delicious, freshly prepared and beautifuly presented. Breakfast was divine, particularly the food and vegetable market where you could pick any of the veggies or fruits on display and they would prepare your juice to order. Juices, we later found, were a main specialty in Luang Prabang and various stalls of locals selling all sorts of juice combinations could be found along the pedestrian streets of the night market. 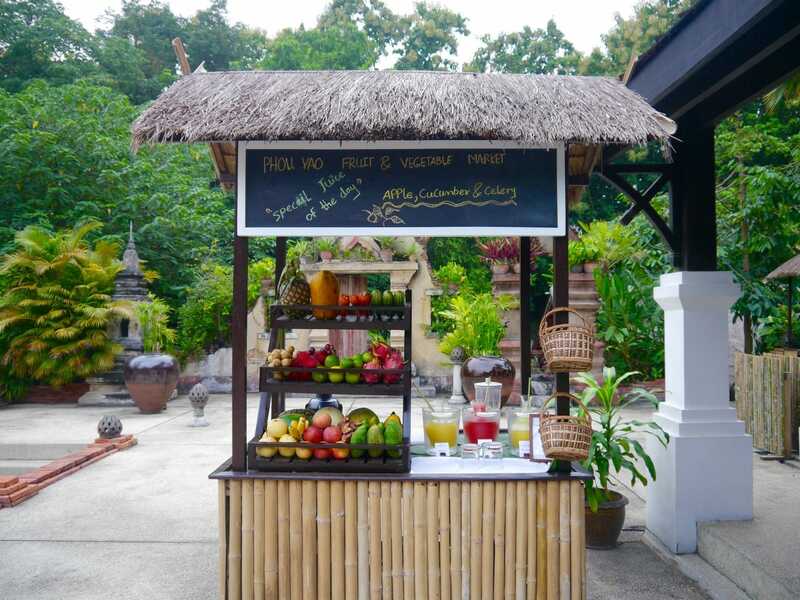 There was any and every possible fruit on offer and even coconuts which I happily sipped on every morning. There were two live stations to order hot food, one for eggs any style and one for noodles, the local breakfast dish. The eggs could be accompanied with various veggies, ham, cheese or bacon and the noodles came with all the condiments. The buffet spread was just what we needed. There were plenty of pastry and sweet options including tartlets and sponge cakes. There was sliced fresh fruit and fruit salad with a nice lemony juice to keep the fruit sharp. The yogurt was incredibly silky and the cheese selection could have made any French person happy. All of these were prepared in-house. Aside from all of the above, there was an a la carte menu to choose from which offered tempting waffles. I (sadly) resisted the entire stay and ended up not trying them but a kid on another table ordered them, to my drooling. Dinner was laid out by the pool with the restaurant tables brought forward to the edge of the pool where candles and lamps were lit for that magical setting. It was peaceful, romantic and private. The bar, adjacent to the restaurant and with plush low rattan sofas along a koi fish pond was cozy and well-employed with a skill bartender ready to mix any drink. We went for the local Laos Whisky drinks and enjoyed various hibiscus themed concoctions that made my friend Marisa very happy. The drinks were always paired with local snacks. I accidentally munched on an entire dried chili that was hidden between the dried bamboo crisps and the dried black mushrooms. I was not happy when my mouth caught fire. The snacks were unique and I had never seen them before. I appreciated how the hotel tried to share the local culture and traditions with the guests through these small details. The hotel grounds are elevated, almost on a small hill, above the city. It would be a leisurely stroll into town but the staff was always ready to give us a lift either on the hotel’s tuk tuk or on the minivan. There are scheduled drop off and pick up times every hour so you can go into the night market in the evening. The gardens were grassy and filled with thick palm trees and other local vegetation. There were orchid gardens and long stairs leading to the rooms. The rooms were on two story buildings that followed colonial architecture with white walls and dark beamed structures. Red tiled roofs completed the simple yet pretty look and feel from the outside. 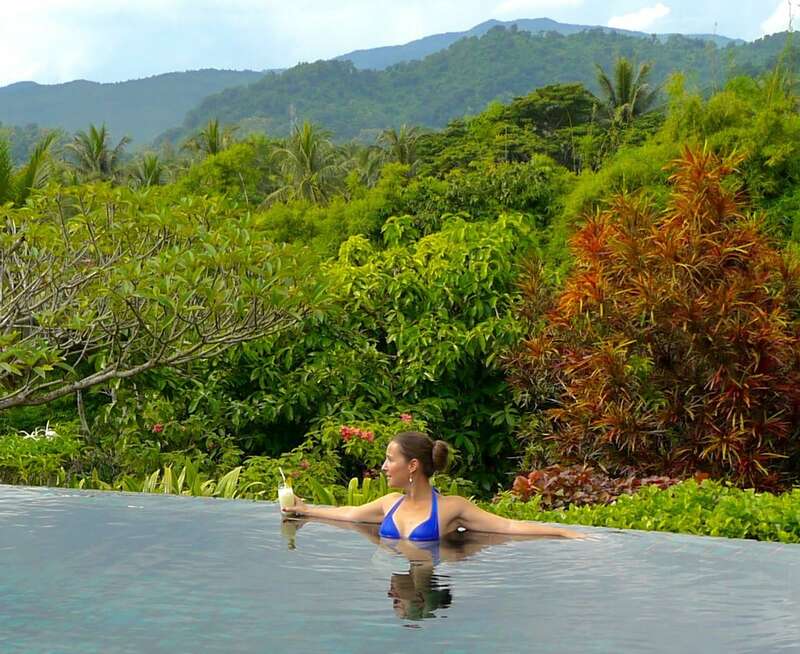 The main swimming pool, the most iconic image of the property, was beautifully blending into the frangipani trees and a great place to relax. We found it to be almost a magnet, attracting us to the sun loungers every time. I must have snapped dozens of photos on, in, or around the pool. The awarded spa had another smaller pool by a lily pond that is almost postal perfect. The turquoise pool water overflowed into the lily pond where fuchsia flowers opened as the sun hid behind the clouds. The environment was serene. We booked a Mo Hom Indigo Healing Art, a signature treatment that followed local Hmong Shamans healing traditions. Hmong people are originally believed to originate from China and are today spread over several countries. Because many of them were secretly recruited by the Americans to fight in the Vietnam War when the Communist government came into power in Laos, they were prosecuted and most fled into neighboring countries. They have animist and shamanistic believes strongly venerating their ancestors. The massage consisted of an Indigo herbal compress used to heat our bodies and then a deep tissue massage followed. I fully relaxed and was almost drooling when the therapist asked me to turn over. The spa is set in the most idyllic location and some of the treatment rooms can be open to face the open grass and the lily pond. It is certainly tranquil. 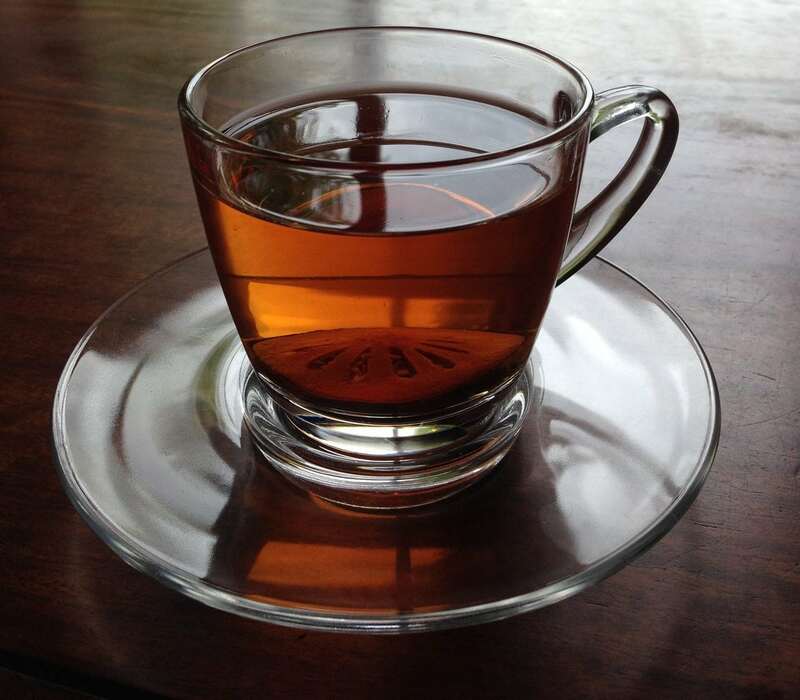 While we were at the spa reception filling in the check in forms we were offered a bael fruit herbal tea. Bael is a local fruit believed to have healing properties good for the digestive system. It had a mild citrus and warming taste. 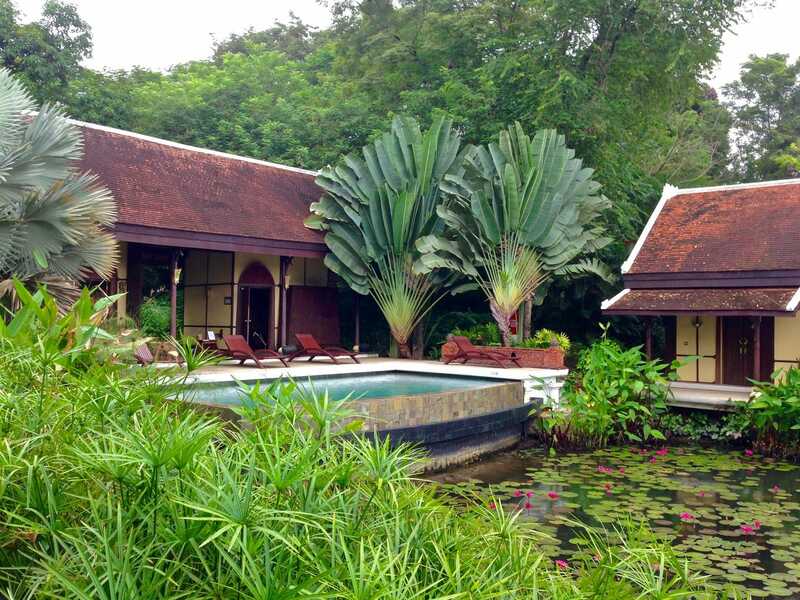 The Belmond La Residence Phou Vao Spa has been awarded Best Spa in Laos at the recent awards in Vietnam in September and was chosen as the Best Spa in Asia in 2013 by Conde Nast. The therapists did not disappoint. 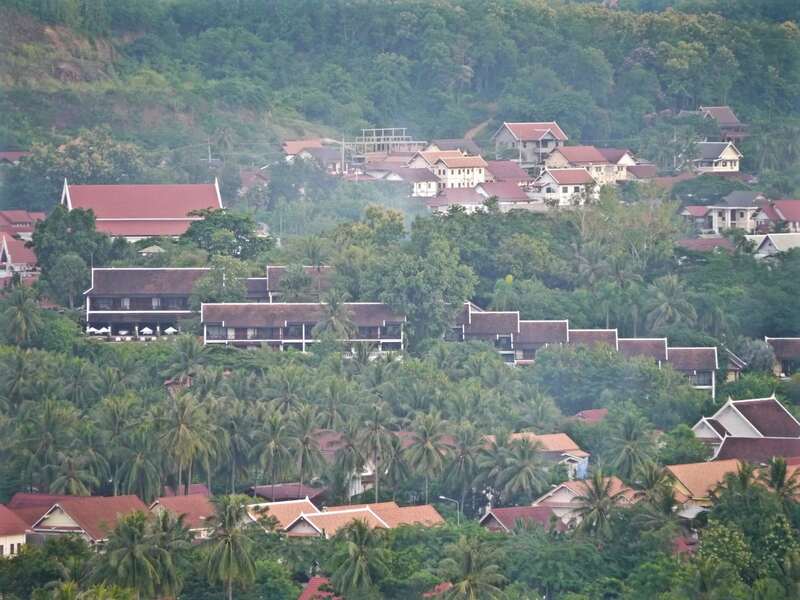 Luang Prabang is actually more of a town than a city but, for an area housing only 60,000 people, it offers a lot to the visitor. I decided to go lured by the idea of an Angkor style trip filled with culture and Buddhist temples, and was met with a long list of things to do that was enough to fill four days easily. The hotel can help organize most of the activities and can even help get a tuk tuk to drive you to the waterfalls in a more typical manner. We went on a half day guided Luang Prabang tour which included the main temples and Mount Phou Si, the pagoda on top of the hill that is visible from the hotel’s pool and suites. I took a Mekong cruise trip to the 4,000 Buddha Pak Ou Caves. Marisa and I took a tuk tuk to Kwang Si Waterfalls, which are also the location of a bear conservation center. We also went on a sunset cruise on the Mekong onboard the hotel’s fabulous boat. On an early morning, and following Thomas’ suggestion, we joined the locals in giving Alms to the Buddhist monks that walk along the city to collect food for the day. At sunrise, the monks will walk around with their large bowls to gather the donations from all the locals. It was a very fascinating and deeply spiritual experience. One of the most interesting activities I have seen a hotel offer was the Mystery Dining journey. We were taken around town for a 4 course meal starting with drinks at the hotel and followed by starter at Tarong, a French-Laotian restaurant in the main street, main at a hospitality school ran by an NGO teaching valuable service and cooking skills and ended up with dessert and cocktails at 525 Cocktail bar where Andrew, the owner, shared with us the life of an expat wealth manager turned bar owner. It was a great way to experience a few lesser known dinning options at our own pace and made for a great weekend. The most invaluable part of the activities was the hotel’s ability to organize them seamlessly, to help us without coercing and to give us options to even do some of the activities at no cost to us. I wanted to go see the caves last minute and gave them no notice. They insisted it would be more beautiful for me to go on the hotel’s boat than by car. Reluctantly, I accepted, not because I did not like the boat, we had a fabulous sunset cruise two days prior in which I even fell asleep to the lulling warm sun rays and the slow drifting of the boat, but because I thought car would be faster. I am glad I followed their advise because I had a tranquil lunch on board, which they packed for me, with rice noodles, a yummy ham and cheese baguette and some fresh spring rolls, and, again, fell asleep to the relaxing floating of the boat up and down the river. The boat’s sun loungers and bed were a much more pleasant option than a car could have been. And the most impressive part is that they got the boat and the food ready in the time it took me to shower. The rooms were lovely, spacious, comfortable and luxurious; The food was local, fresh and delicious; The Spa was award-winning and decidedly relaxing; the activities were luxurious but local, with a personal touch; but the service was the kind of hospitality that only an old friend can provide. Every member of the team spoke good English. They had a permanent smile on their faces and they knew us by name from the moment we checked-in. They were welcoming and helpful, trying to anticipate our needs before we even knew we had them. They were always ready to make our stay extra special and organized all excursions swiftly and fabulously. They provided their advise, even when we didn’t ask for it, in a professional and sincere manner which definitively enhanced our time there. There were lots of details that showed they were genuinely hosting us and wanted us to have a memorable experience. We never had to wait for anything and their willingness to find a solution for any questions we had was admirable. The team was discreet, at times silently showing up, and almost always available to help with anything. I could start praising every single one of them but the list would go on. 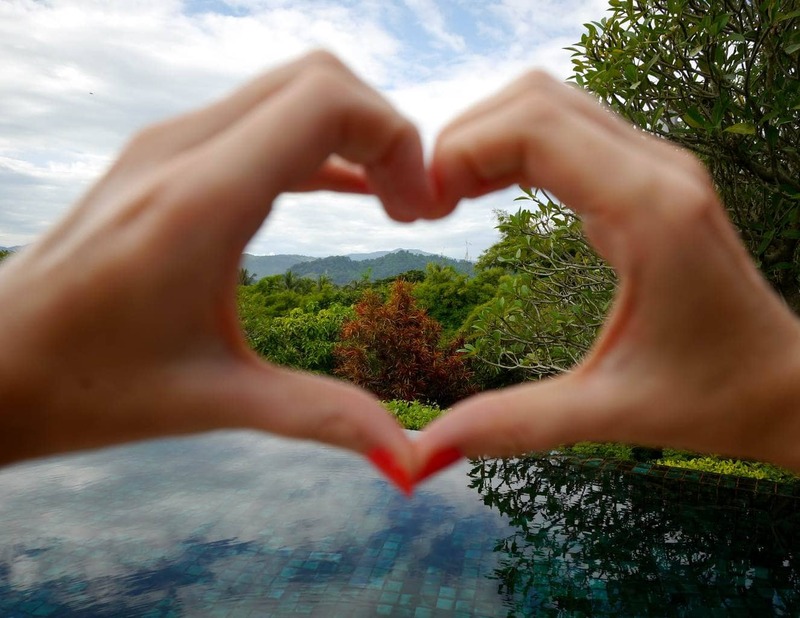 From the friendliest of them, the boatman at the hotel’s Mekong boat, to Soi and the Spa Manager, they were all a lesson in Asian hospitality with a heart. Talking with Thomas, the GM, he recognized most of them had been with the hotel for a long time. This is, to me, one of the best signs of a good business: the ability to retain employees in the cut-throat service industry. 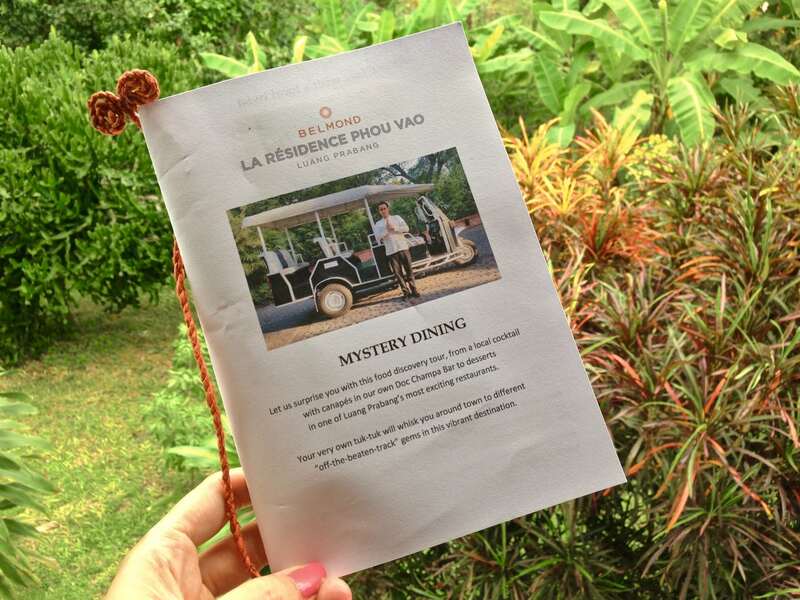 I have only great things to say about the Belmond La Residence Phou Vao and almost nothing to fault. Whereas the hotel is small enough to provide extremely personal service, it is also spacious enough to give you room to breath. 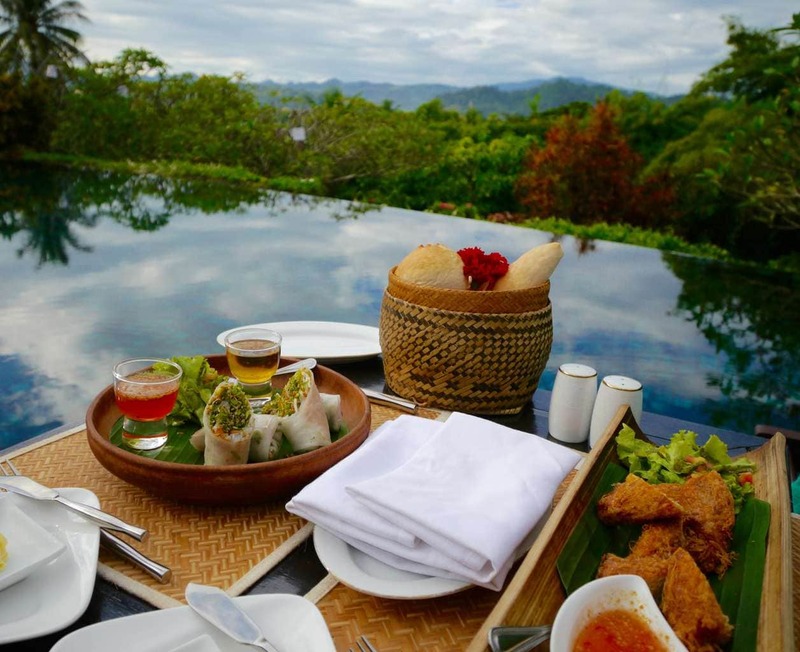 Without having tested other high-end options in town, namely the Sofitel, formerly Hotel de la Paix, or the Aman Resort, I can honestly recommend Belmond as THE option for a fantastic, genuine and luxury stay in Luang Prabang. 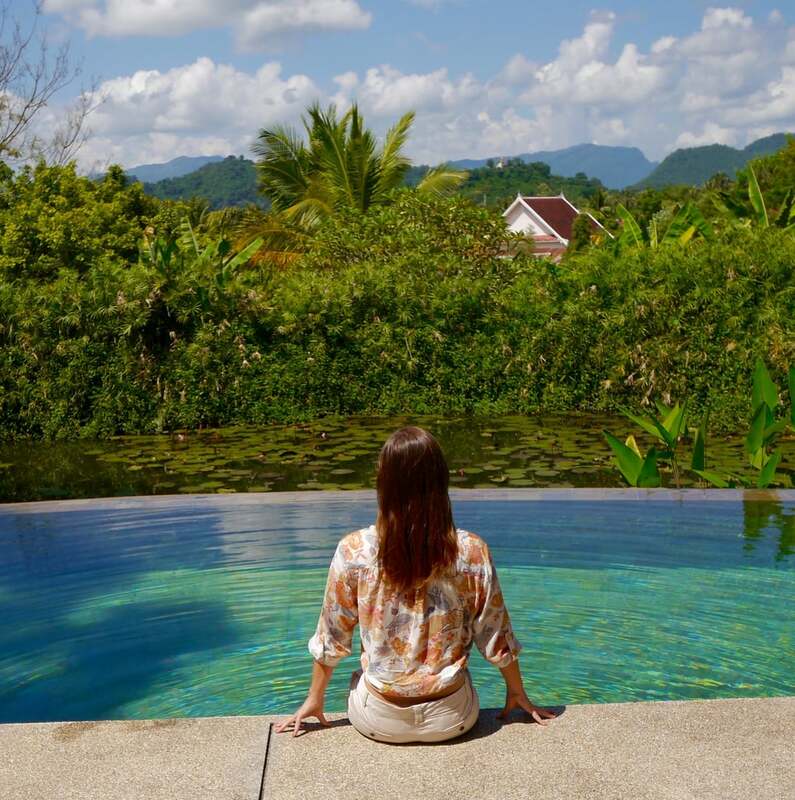 The architecture, the rooms, the service and the spa go a long way to project what Luang Prabang is all about: spirituality, friendliness and heritage at every corner. Not to mention the amazing Laotian cuisine which completely stole my heart. 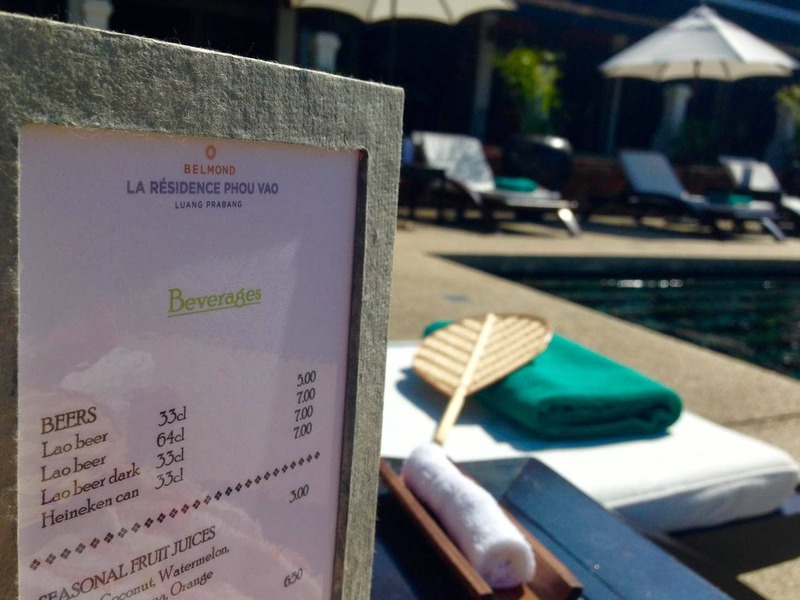 Once in a Lifetime Journey was a guest of Belmond but, as always, this is my honest review and I would genuinely recommend the hotel to my closest friends.